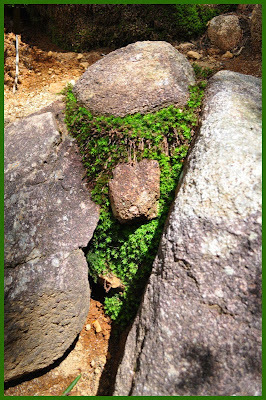 While I waited for about two hours, my husband climbed the steep slopes up to the "Hall thrown into the cliffs", Nage-ire Doo.
. Spikemoss (iwahiba 岩檜葉, iwamatsu) . 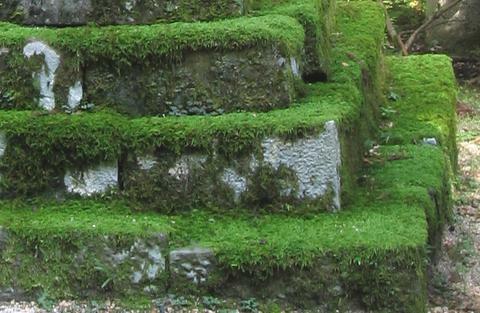 As Nakamura Sakuo has rightly pointed out, moss is fundamental to Japanese culture. The humidity and proper temperature in most parts of Japan are just right for the grow of it. 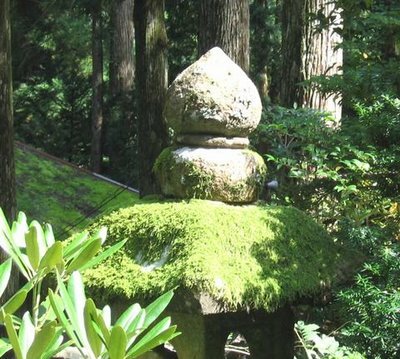 There are many famous "Moss Gardens" in Japan, especially in the old temples. 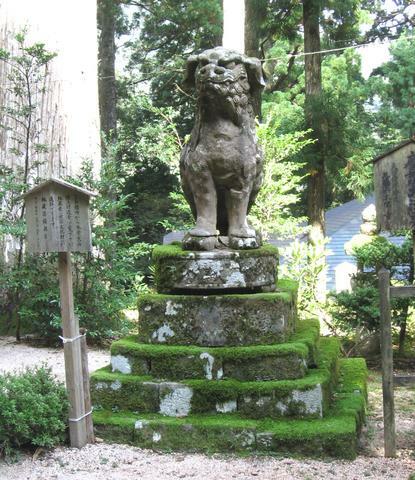 Saihoji Temples is popularly called "Koke-dera 苔寺" or Moss Temple. True to its popular name,its garden is thickly covered with moss of many varieties. Though the garden is beautiful with its carpet of velvety moss, this fact has nothing to do with the original design concept of this garden. Another point which we must bear in mind regarding this garden is that it was laid in the closing years of the Heian period through the early days of the Kamakura Period (in the latter half of the 12th Century).It was not laid out, as popularly believed, by the most Reveredend Zen Buddhist Priest Soseki Muso in the Nanbokucho Period (1333-1392). This garden,which is of an ancient style dating far back beyond the days of Rev.Muso, doubtlessly is one of the most celebrated gardens representative of Japan.The garden in itself is an eloquent example of the outstanding quality of esthetic culture which flourished from the Period (from the 8th to 12th Century). The fact that this garden was designed in the latter half of the 12th Century can be verified by the style and technique employed in its creation. this can also be proved with literary evidence. The Temple is often termed "the moss temple" with its moss-covered stone steps (roughly 50) leading up to the Hokkedo hall from the Deva gate. In order to preserve this natural beauty, visitors are not allowed to walk on the steps. Instead, there are a spare flight parallel to it from which they can observe the moss and walk up to the Hokkedo hall. From late April through May, white flowers of Shaga (fringed iris or Iris japonica) are in full bloom on both sides of the steps. 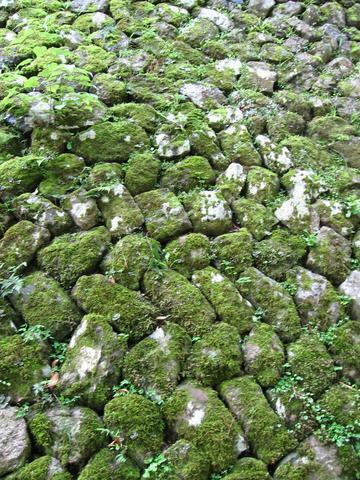 In June, the moss is lively and most beautiful. More MOSS haiku by ISSA ! had its origins way back from the Edo period when some bonsai where exposed without a container. In this case the root mass was so developed and compact that held together the mass of substrate used for the cultivation of the plant. Today kokedamas are different. Special mix of soil containing akadama clay is used to give the shape and holding capacity of the plant,which are usually small grasses, flowering plants, orchids, pine seedlings, etc. The possibilities are only limited by your imagination. 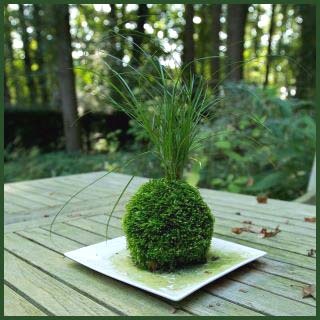 Live moss is attached to the outer space of the"container"with biodegradable string,which deteriorates with time, leaving the moss layer attached to the substrate mix. A fun, easy and enjoyable way to keep plants in limited spaces. There are endless variations of bases used ,including hanging kokedama with a string of twine. I love these small jewels. They can capture the essence of simplicity and beauty in Japanese designs.
. - koke 苔 moss and Kappa - . Another Moss Temple in my Neighbourhood. 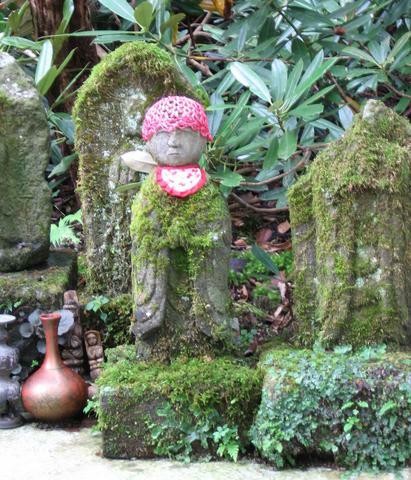 Thank you Gabi san for your information on Moss Temple in Kyoto and Kamakura. You have guided me to the best points of sight seeing. I have enjoyed them in autumn bright afternoon. I understand that you are a super lover of Japanese culture. In some case Gabi san has much more knowledge than us about Japan. You are most welcome, Sakuo san. I like to share MY Japan! Overturning our grasp of what is civil and what is wild, Marc Peter Keane's collection of nine short stories revels in the illusory space between culture and nature. A garden designer by trade, Keane forays into fiction with the wisdom and sure-footedness of someone all too familiar with manipulating the boundaries of the natural world. In "A Peaceable Kingdom," the tranquil lives of a picture-postcard American family are bewildered by discoveries of untamable nature. A girl made mute by the violence of her childhood finds solace in the orderly house and pruned gardens of her uncle's country manor in "Gardens of the Soul." And in the title story, "Moss," an overworked employee in a large Tokyo corporation pines for the return of the wild to his city, while trying desperately to discern the natural from the artificial in his surroundings. From 18th century English countryside to contemporary Tokyo, from a covered wagon crossing the American desert to a high-tech private yacht crossing the Pacific, Keane's tales offer, in alluring prose, thoughts on how to understand our place as humans in the wild world. LOOK at a lovely photo of koke Jizo !